My website name describes where I live. On a hill, shaded by old oak trees, in a home with a beautiful porch where I can hook rugs. 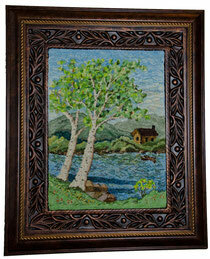 The art of traditional rug hooking has been around for hundreds of years. Creating a hand hooked rug is still being done today as it was long ago, with the simple tool of a hook and strips of cloth. Now it is considered an art form. Rug hooking has no limit for creativity and imagination. I hope you enjoy looking at the hand-hooked rugs, hand-dyed wool, rug hooking patterns and appliqué patterns that are on the following pages. Spring Fiber Fling is one week away!! March 9th is the Spring Fiber Fling in Wildwood Florida! Registration is full! Yes, we are having a fashion show, so bring your finished wearable fiber art, knitted socks? Wear them. Woven a shawl? Bring it along! Hooked a tote bag or poncho? Let's show them off! Yes we are having a spinning circle! Bring your spinning wheels and join us! Lunch is by TooJays Deli, always delicious. Fiber exhibit will be set up to display finished items, from wool applique to art yarns, to hooked rugs and woven towels. Bring your finished items to inspire everyone! IF you would like to do some shopping, you may come AFTER 11 am and the fee is $7.00 at the door, for shopping and viewing the exhibit only. And watch a demo of course. And of course, door prizes! Demonstrations are scheduled throughout the day, there is always something to learn! This is Oscar! 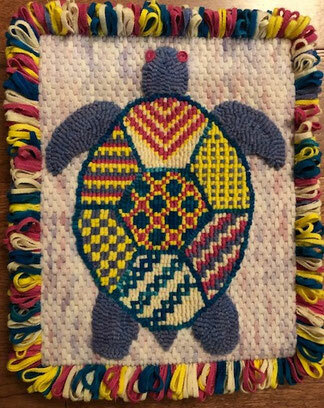 Anne Doucet from Titusville FL hooked this charming sea turtle using several fun decorative stitches. I had the pleasure of teaching the class in January in Titusville. We focused our fiber fun on learning these stitches to add texture and interest to our rug hooking. Thank you for inviting me to teach, and sharing the picture of your finished Oscar!